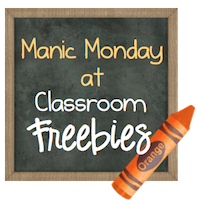 We are linking up with The Appilicious Teacher for her "An Apple a Day" Linky Party! This week the theme is Small Group Instruction. We are going to share how we handle Small Group Instruction during Math. Math is a tough subject to teach; so many concepts, so many ability levels, so hard to just "move on" when you know you have kiddos that are stuck. We were struggling with a way to teach whole group but have a small group component to our Math block. So, Math Bags were "born!" Math Bags allow us about 15 minutes of uninterrupted time to meet with small groups for remediation, review, and challenge. We are only able to meet with 1 group a day...but that's one more group that we met with before! This has been a blessing. The small groups are fluid like a Guided Reading group is; we move kiddos around based on the lesson and need. Now...let's talk about what the other students are doing...this is where Math Bags come in. 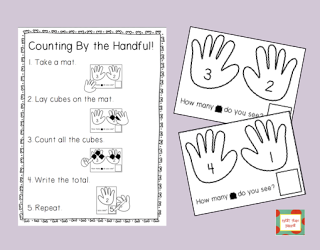 Math Bags are engaging activities that students work on in pairs to review math concepts. They were designed in a "budget friendly way," as none of the activities require a colored printer or multiple copies. 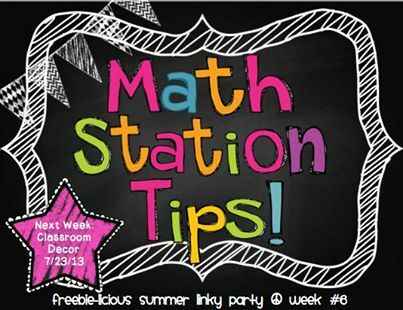 We only change Math Bags once a quarter, so no more working on math centers every weekend! Our kiddos love them and we have seen great results having a time in our math block to work with students 1 on 1 and in small groups. 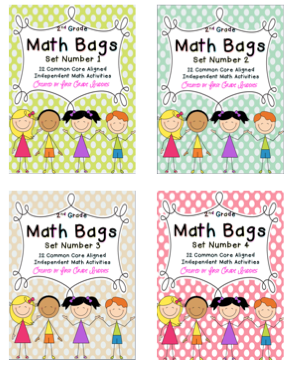 We now have 4 sets of Math Bags available for Grades K, 1, and 2 in our store. 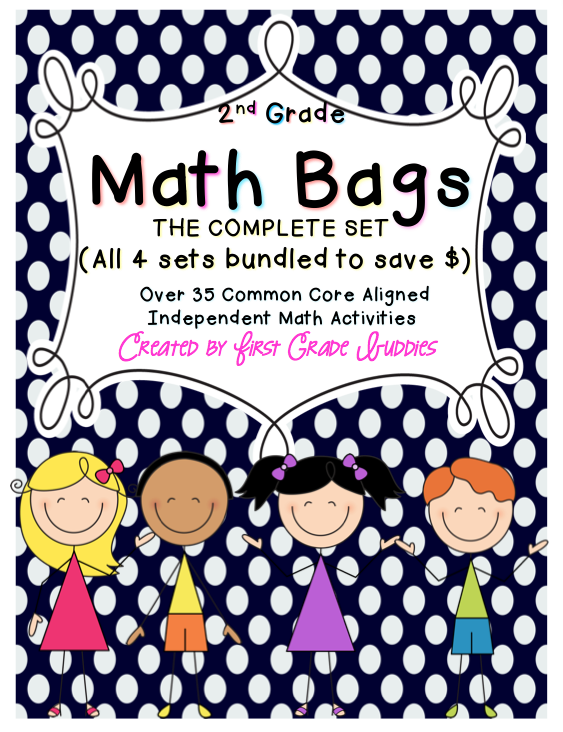 Each set of Math Bags contains 12 activities; across the 4 Common Core math strands. Each set can be purchased separately or you can buy the complete set (which is priced to save you money!). 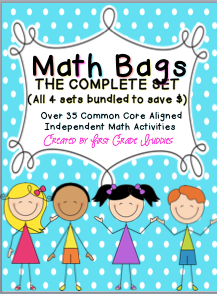 These are the Complete Sets (each grade level set bundled together; it's priced as buy 3 get 1 free!). Under each set you can grab a FREEBIE sample! 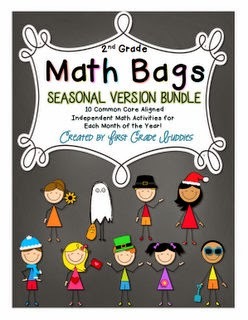 Picture 1: Each math activity is literally in a Ziploc (gallon size) bag. The bag holds all the contents for that activity. The bags are labeled (both on the outside and on the inside baggies that hold the pieces). 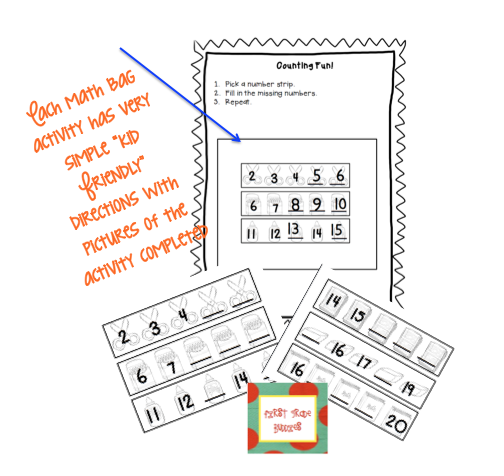 Everything in each Math Bag is laminated; there are no worksheets to copy, collect, grade, etc. 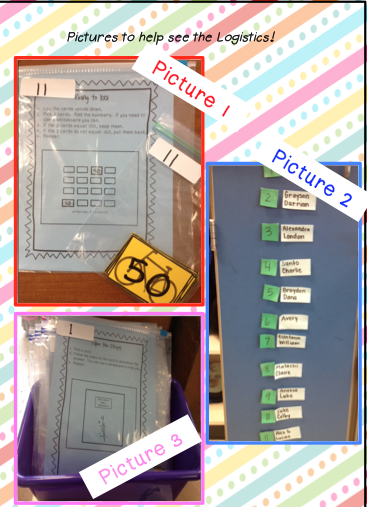 However, several of the Math Bags have a recording sheet that students use and erase when they are done so the next students can use it. We always copy Math Bag direction sheets on blue so the students know exactly what to look for. We always copy the pieces and parts that go inside the Math Bags on yellow for consistency as well. If there is a Math Bag that needs another color, we use red. Our goal is to make these very streamlined to limit questions while we are working with small groups. Picture 2: On the closet door, the numbers 1-12 are hanging with Velcro. Student groups are also hanging on the door. Each day we move the numbers down 1 row so that the Math Centers change for each group of students. 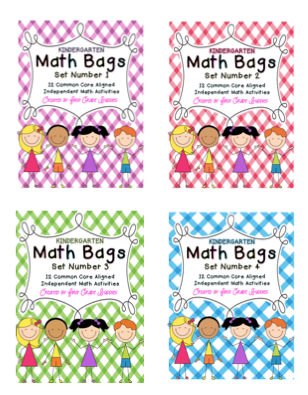 Within a quarter a group of students may do each Math Bag 1-3 times. Picture 3: This bucket holds all 12 Math Bags. We picked this picture to show that this system doesn't take up a whole lot of room. Another note: we actually have Math Bag Helpers that hand out Math Bags, switch Math Bag numbers (mentioned above), and check to make sure Math Bags are cleaned up before putting them back in the bucket. 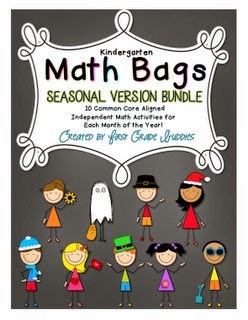 We've also now added Seasonal Math Bag Sets! Thanks so much, Tamara! We are having a great summer! We hope you are too! I am really interested in the math bags but I have a question. Do you just place these in bins each week or do the kids actually get a bag with the activities in it and they choose what to work on? Are there recording forms with the activities too? Thanks! Hey there, Jessica! GREAT questions! 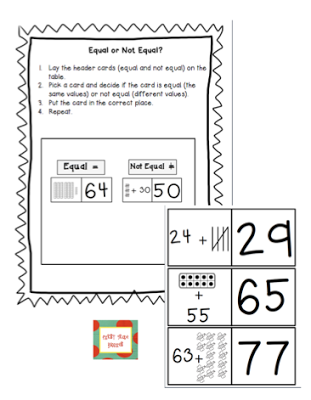 I tried to help answer some of these questions by adding a section to this post, I added pictures of our Math Bag set up and explained how we organize everything. Let me know if you have further questions! We are happy to help! 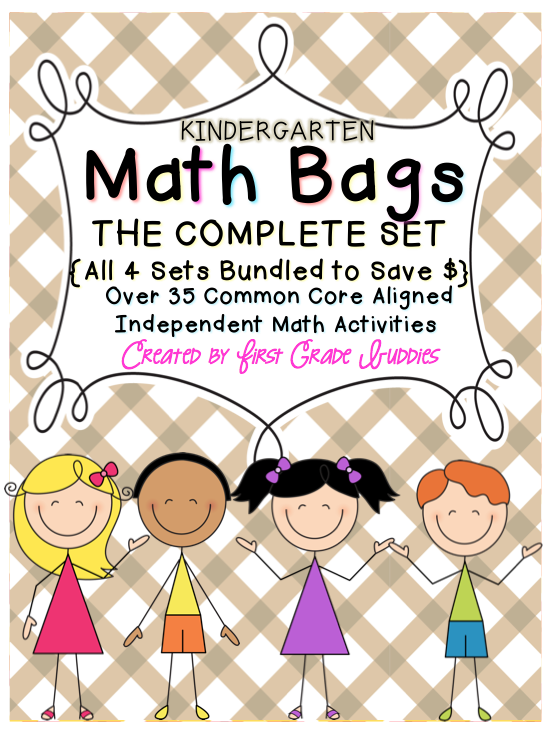 I meant to say the part I added is above the freebie, it says Math Bag Set Up. What a nice way to incorporate independent, center-like work without all of the prep and (like said) expense. Great idea. Thanks! Less teacher work is a plus! Thanks for the freebie! I love the kid-friendly directions!! I have the same questions as Jessica (comment above). I'd love the hear a little more about the logistics. 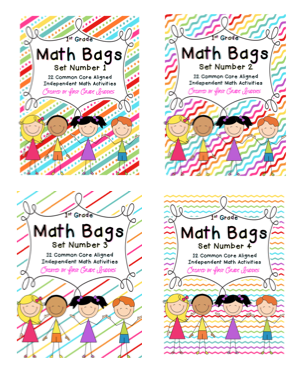 Your math bags seem like they could be a great addition to my math workshop. Hello, Karli! I added a section to this post to help clarify. 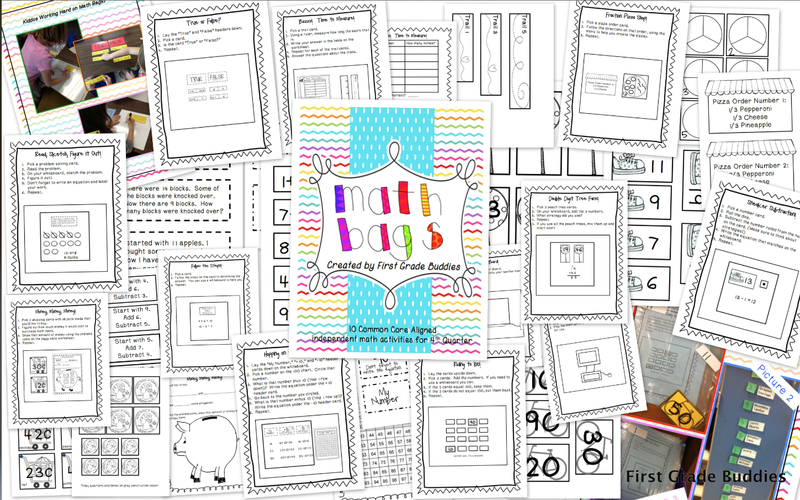 I think pictures always help a great deal, so I added a few with a "Math Bag Set Up" heading (at the end of the post just above the freebie). Let us know if you have further questions, we are more than happy to help! I teach 3rd Reading right now, but one of my best friends teaches 1st Grade Math. I'm going to send her over to check these out! Thanks for sending her our way! Have a great 4th! This sounds like what I have been looking for. 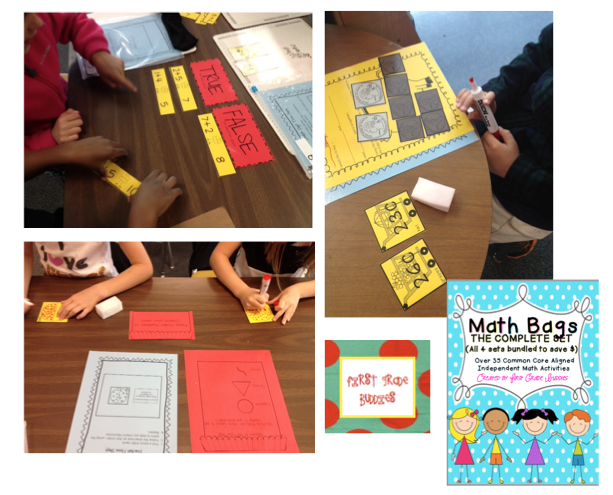 I have struggled with the whole math station concept and the logistics of it all! These are in my cart at TPT! Great idea! Great! We hope they work out well in your classroom! Thanks for linking up. You have a great set up and lots of ideas to share. 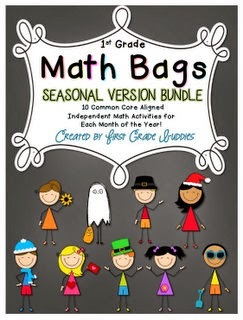 I just downloaded the winter math bags. My question is how do you check up on how the children are doing with their answers if they just erase everything and you are busy with a small group? Thanks! We check in with kiddos as often as we can; which is hard but allows us to catch mistakes as needed. Was thinking the same thing as Barbara... Is this self-correcting in any way? Do you have any way to get feedback on what/how they're doing? It is not self correcting; we check in with the kiddos as often as we can. how do you partner up your kiddos? are they partnered heterogeneous or homogeneous, in pairs, or multiples, or singles? Thank you for all of your hard work preparing these Math Bags. I have always used centers in my second grade classes and feel they are valuable practice to curriculum.